Holistic Bio Spa Introduces our guest, patient, and friend: Julie Bunker, a 61-year-old woman who found the solution to her chronic digestive problems with natural alternative medicine in Puerto Vallarta. Keep reading to find out more! The following story has been submitted originally by Julie Bunker to PV MIRROR, a local newspaper in English for North Americans and Europeans in Puerto Vallarta. “If you are someone who’d like to cure what ails you, and possibly lose some weight during the process, this article is for you. Frankly, I was to the point that I didn’t think I could get any relief, and then, at the advice of a friend, I went to the Holistic Bio Spa in Plaza Marina and met Zoli Hargitai. Zoli, originally from Hungary, is a Holistic Naturopath who provides Alternative Medicine solutions. He’s also just a very down to earth guy who is tremendously knowledgeable and passionate about his. 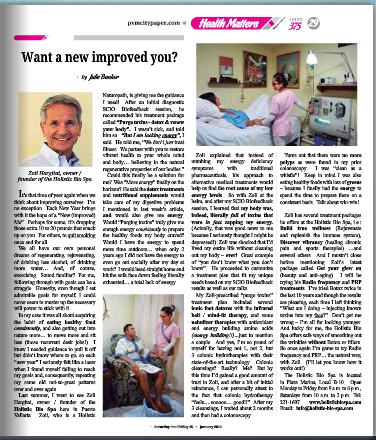 Click the image to read Julie’s article in Puerto Vallarta’s local newspaper on page 29 under “Health Matters” No. 375. Zoli, the Holistic Naturopath, and owner/founder of the Holistic Bio Spa became my big hope. I learned that his passion is to empower others by giving them the tools and knowledge needed to feel great – all with a holistic approach. Truly anything sounded good to me at this point, so I made an appointment, and the rest is history. Through biofeedback, several detoxing treatments, and Nutritional Supplements taken daily at home, my body is back to its normal rhythm. I feel 10 years younger, I have much more energy, no more bloating and I even dropped some pounds! When Zoli recommended a regimen of various de-tox treatments, I said, “Hey Doc, but I eat healthy foods! I’m sure I’m not storing a ton of toxins!” Well, being the patient guy he is, he said I needed to also consider what I’m breathing into my body (nothing to do with a healthy diet). I immediately thought of waiting in traffic behind those Vallarta buses with the thick, black exhaust. Or what about pet dander, mold, mildew, dust mites, bacteria, secondhand smoke, paint and cleaning liquid fumes, etc…??? Eating right doesn’t get rid of that build up in your body. But Zoli’s de-toxing does, and did. Have you ever had an Ionic Foot Detox? Or breathed in amino acids thru a nebulizer? How about a Colonic Cleansing? Or sitting in the infrared sauna made from toxin-free cedar wood and sweating it out? Have you considered an Ozone Facial, or Liposuction without surgery, Acupuncture, or a Vitamin C IV? Have you thought about the water you drink? Would you benefit more from Alkaline water? (The answer is YES). Believe me, there is much more to tell, but bottom line – my bloating is gone. I eat when I want to and know that it will no longer lead to bloating. I go out in public with confidence that I will be comfortable the entire time. And beyond the bloating, Zoli also helped me with my hot flashes! With the simple addition of a Nutritional Supplement that my body needed, they have disappeared. (major miracle!) And he recommended PRP for my knees – another miracle treatment! Subscribe to our blog for easy diet and lifestyle hacks to improve your mind, body, and spirit! Do you have any questions about Julie’s journey and natural treatments for chronic digestive problems?